How many hours does the UV-C lamp last? Life of UVC lamp is 9000 hours. Will the UV-C light degrade fiberglass insulation inside the AC duct housing next to the coils? Fiberglass insulation holds up quite well to UV-C. The UV-C will not affect the glass component in the insulation, it can affect the binders in the insulation, but overall we tend to not worry about insulation if it is glass based. Same thing can be said for filters, i.e. synthetic filters will get eaten up by the UV-C, but glass-based filters (e.g. HEPA) hold up to UV-C.
What is the range of ambient temperature? What is the range of ambient operating temperature of the UV-C Air Sanitizer? UV-C is a type of ultraviolet (UV-C) energy in the 260-nanometer frequency. The “C” wavelength is the most germicidal in the UV-C spectrum. Why do I need a Bio-Shield UV-C Air Sanitizer? Studies have shown that inadequate ventilation in homes causes indoor air to be up to 2-5x more polluted than outdoor air. With up to 65 million North Americans suffering from asthma (8 million children), allergies or other respiratory issues, these conditions can be triggered by molds, dust and other aggregates. (Studies have also shown that one gram of duct dust can contain up to 50, 000 bacteria). UV-C Lights kill viruses and super small bacteria that dont get trapped by the thickest of furnace/AC filters. Even HEPA filters cant catch them. Viruses are as small as 0.003 microns and bacteria down to 0.2 microns. HEPA filters, if youre lucky, claim to catch 0.3 microns, but good luck getting any airflow. Thick filter = minimum air flow, great filtration. Thin filter = maximum air flow, little filtration. Optimum filter (MERV 9-11 rating) = good filtration and good air flow. How can UV-C Lights help me? Asthma, Allergies, Hay Fever, Fatigue, Insomnia, Dizziness, Depression, Headaches, shortness-of-breath, coughing and wheezing. Also, when someone in your household catches a virus (cold, flu) the virus will be killed off sooner. Before centralized HVAC existed, ill family members would often get isolated in a dedicated room, so that no one else in the family would get sick. However in modern times, there is no longer a “sick room” because the air in all the rooms is pulled back into the main duct system and re-distributed everywhere in the house. With a Bio-Shield UV-C Air Sanitizer system, you can now create that “sick room” once again. The viruses lurking in that room where a family member is ill will eventually get pulled back into the duct system and be killed by the UV-C light, keeping everyone else in the house at a lower risk of getting sick. How does it affect HVAC biofilm? The “C” wavelength targets the DNA of microorganisms, causing cell death or making replication impossible. The UV-C energy kills or inactivates microbes, eradicating surface biofilm. Yes, Bio-Shield UV-C Emitters continuously clean coils, drain pans, plenums and ducts; improves product quality, shelf-life and yield in food processing plants. Does UV-C relate to UVGI? The two terms are basically synonymous. Ultraviolet Germicidal Irradiation (UVGI) is a term used by Federal Agencies such OSHA, NIOSH and the CDC when referring to UV-C.
UVV light refers to another wavelength in the ultraviolet spectrum. Some UV-C devices also produce light in this wavelength. 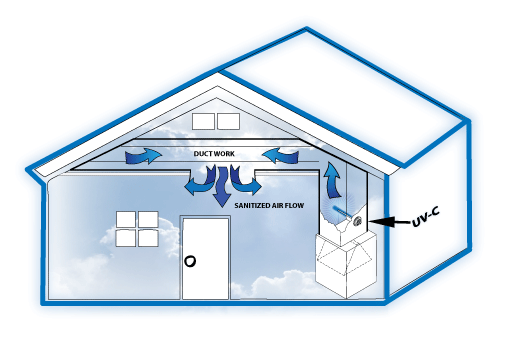 The manufacturers of these devices promote UVV as an added tool for IAQ control, saying that UVV attacks microorganisms, chemicals, and odors. While this may be true, it is important to understand that UVV (unlike UV-C) will also “attack” occupants in treated spaces by adversely effecting human lungs! The reason for this is that the shorter (185 nanometers) wavelength of UVV light actually generates ozone. This occurs because UVV light reacts with oxygen to break it into atomic oxygen, a highly unstable atom that combines with oxygen to form O3 (ozone). The American Lung Association states that “exposure to ozone causes a variety of adverse health effects, even at levels below the current standard.” And the U.S. Food & Drug Administration says: “In order for ozone to be effective as a germicide, it must be present in a concentration far greater than that which can be safely tolerated by man and animals.” The longer (254 nanometers) wavelength of UV-C light, by contrast, provides highly effective air, surface, and water disinfection without producing any harmful ozone. The materials and methods of UV-C lamp construction determine whether a given UV-C device will produce both UV-C and UVV light or only the safer UV-C wavelength. Bio-Shield UV-C devices do not produce any UVV. Yes. The Bio-Shield UV-C Air Sanitizer degrades organic buildup in coils, keeping coils continuously clean. This lowers HVAC energy costs by improving heat transfer and increasing net cooling capacity. 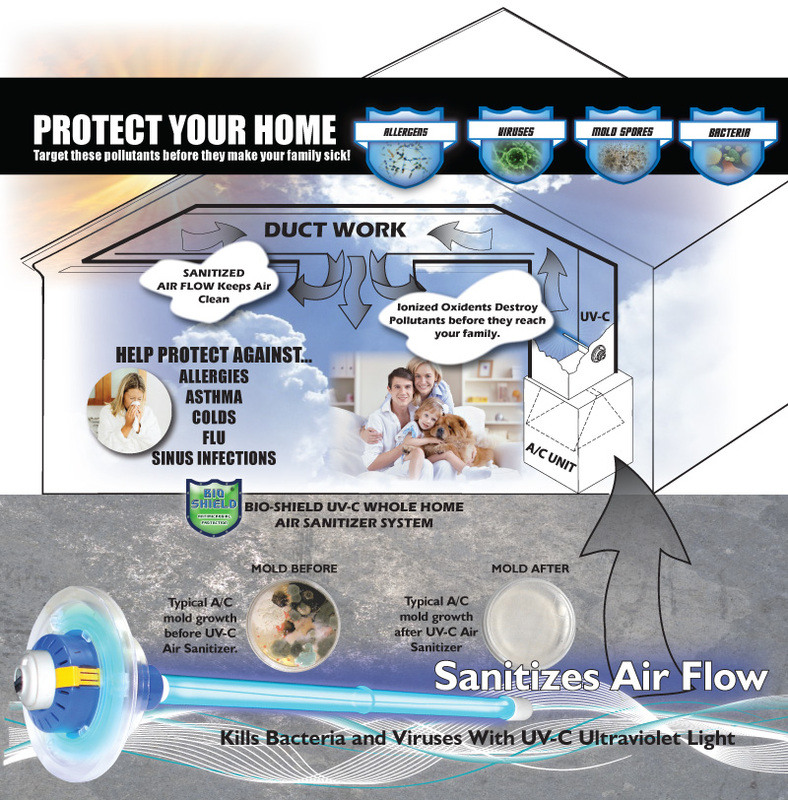 Will UV-C kill mold in ducts? Will UV-C kill dust mites? No, Bio-Shield UV-C devices do not produce ozone or other secondary contaminants. How will I save money with UV-C? In commercial, industrial or institutional buildings, a Bio-Shield UV-C installation offers the most rapid payback in the industry. A typical installation can pay for in less than two years and save thousands of dollars thereafter in energy and maintenance costs. This is possible because the devices continually clean coils, drain pans, plenums and ducts, reducing or eliminating costly cleaning programs. HVAC energy costs are lowered by improving heat transfer and increasing net cooling capacity. General IAQ is improved for better productivity and less absenteeism. Product quality, shelf life and yield in processing plants are improved as well. No, a UV-C fixture is an air conditioning component that is used in addition to other system parts. These include the coil, heating core, fan, dampers, humidifiers, filters, etc. All are designed to do some form of work within the air handler or on the air. The UV-C Air Sanitizer should be used in conjunction with standard and high-end filters. HVAC filters trap airborne particles based on their size, allowing most microorganisms to pass through undeterred. The UV light attacks microorganisms. It is recommended to install the UV-C Air Sanitizer downstream of the air filter. Do I need UV-C if I use antimicrobial filters? UV-C is not a replacement for filters. UV-C addresses the problem of coil “biofilm” which is usually downstream of the filters. Antimicrobial treated filters rely on direct contact to kill the microbes. As the filter builds a layer of dirt on it, this direct contact is eliminated and the microorganisms will not be affected by the chemical treatment. Therefore, treated filters will not accomplish the task of eliminating the growth on the coil. Bio-Shield UV-C Air Sanitizer fixtures are designed specifically for installation in HVACR applications. On existing systems, infestations always exist. Therefore, the best results are obtained when the light is located downstream of and facing the coil. In this location the user can expect the highest efficacy in eliminating surface (coil and plenum), drain pan and airborne microbes. On new systems, it can be placed either up or downstream of the coil and aimed at the coil. Is the UV-C Air Sanitizer hard to install? Installation instructions are available. Depending on the fixture size and style, installation time can average about 15-20 minutes per fixture. BUVAS installs from outside your unitno need to open equipment to get going, or to change the lamp. Simply apply the installation template and follow its directions. BUVASs lamp and lamp socket are water resistant, shock resistant and built to last. Its low voltage meets all codes. The BUVAS is safe and simple just right for todays requirements and its affordable and easy to install. The factory must always be involved for infectious disease applications. How do you size it? For IAQ, improved heat transfer, reduced maintenance and odor, the rule of thumb calls for about 24″ of UV-C Emitter length for every 4 square feet of coil face area. The factory should always size applications involving infectious disease applications. Do you clean the coil first? No. UV-C will degrade all of the organic material on and within a coil, usually within 30 days or less. Prior cleaning of the coil is not necessary, and may delay the benefits of UV-C.
What are the limits of temperature, humidity and velocity? Limit rules of thumb are 32-170° F, 99% RH and 1000 fpm, respectively. Can UV-C products be used at 50Hz? Yes, all of our voltage options can be used at 50Hz. How does the UV-C Air Sanitizer work? The UV-C Air Sanitizer installs inside the plenum of a forced air heating or air conditioning system. The powerful UV-C rays reduce airborne contamination, as air passes the bulb. Does the UV-C Air Sanitizer kill mold? Yes. the UV-C Air Sanitizer uses powerful UV light to help reduce and kill mold, bacteria, viruses, dust-mites and other airborne invaders. Is the UV-C Air Sanitizer harmful in any way? If properly installed inside the duct, air health is a safe and practical product. However, direct exposure to UV light is not recommended, as it may cause damage to skin and eyes. UV light does not pass through solid materials such as plastic, glass or metal ductwork. How long has UV been used in air purification? UV has been used to purify air since 1936. It was first used to sanitize air in a surgical operating room. UV has been used in schools to reduce the development of epidemics. Restaurants, veterinary clinics, barber shops, incubation rooms, and hospitals also use ultraviolet light applications. What is the importance of UV light products? Over 90% of people’s time is spent indoors. Concentrations of microorganisms will increase indoors, with little or no ventilation. With a larger number of death cases being caused by various bacteria, controlling the development and spread of pathogens is of chief concern in indoor environments. According to indoor air quality experts, controlling airborne microorganisms is the next major challenge of the HVAC industry. Why use a UV light product? The two primary benefits to using UV light are disinfecting air and preventing growth of mold. The UV light radiates a surface to keep mold from growing in that area and disinfects the air stream as it passes through the HVAC system. In one pass over the UV bulb, a high disinfection rate is not normally accomplished in the air stream. With repeated circulation of air through the system, a major disinfection rate is accomplished, making use of UV light very positive. Is the product suitable for people with severe allergy or asthma problems? Yes. By reducing airborne contamination, air health can offer relief to many allergy and asthma sufferers. The device is not solely for people with respiratory disorders. Your whole household can benefit from breathing “healthified” air. Why does the unit remain on at all times? Microorganisms collect in moist, dark places. When the light remains on, the reproduction of these organisms may be reduced. The method also simplifies the installation. Complex wiring into the fan circuit is eliminated. Isolation relays, sail switches, and pressure switches are not required for installation. The unit plugs into a standard 120-VAC outlet. It is also more energy efficient to leave the bulb on constantly. Similar to fluorescent lights, the energy necessary to switch on the UV bulb is high, while functioning energy is low. What is the best location for the UV-C Air Sanitizer? Install the UV-C Air Sanitizer in either the supply or return plenum of the warm air heating system. With A/C systems, the best location is over the air conditioning coil. Why does the bulb require a yearly replacement? After 375 days of operation, 9, 000 hours, the bulb starts to become “solarized”. The UV-C output is condensed to around 80% of its original intensity, which steadily weakens thereafter. The bulb will still be illuminated, producing visible light, however, the UV-C light will diminish reducing effectiveness. The warranty of the UV-C Air Sanitizer is one year from the date of purchase for the unit and 30 days for the bulb. How does the UV-C Air Sanitizer differ from other UV devices? UV energy has been successfully used for many applications including water treatment, hospitals, etc. the UV-C Air Sanitizer was designed specifically for use in HVAC systems. It creates a consistent, high output of UV energy. the UV-C Air Sanitizer’s intensity output maximizes microorganism disinfection and guarantees cleaner indoor air. What is UV-C light and how does it kill bacteria? UV-C is the invisible, ultraviolet, C-band radiation that makes up part of the sun’s light spectrum. By altering the DNA and RNA and effectively sterilizing the organisms, the UV-C light prevents growth and germination of microorganisms. Once sterilized, they cannot reproduce and with their short life cycles, they are successfully killed. It is suggested to regularly inspect air health’s operation through the view port to make certain the bulb is on. It is also essential to change the UV bulb yearly, as the intensity of the bulb’s output diminishes over time. Studies indicate that after 12 months, ultraviolet output will fall below minimum requirements for protection. Even though a bulb may appear to be operating satisfactorily, output intensity may be significantly reduced. The changing of the UV bulb should be done during yearly furnace or A/C Inspection. Can the UV-C Air Sanitizer be installed in the return air? Yes! The return air plenum is an optional location. We recommend the unit be positioned upstream or before the humidifier. This should prevent the bulb from getting water spots. Water spots will reduce UV output. Installation can take 10 minutes. We suggest allotting 30 minutes to play it safe. A quick look from a distance may not be a problem, but looking at a UV-C bulb close up for 5-10 seconds could injure the eyes. UV-C light will injure human tissue following continuous exposure and can severely burn the eyes. Shielding the eyes with plastic protective goggles is highly recommended. UV light cannot be seen. When you look at a UV bulb, you are seeing the visible light, not UV light. There are numerous bands in the UV light spectrum. UV-C is used to control mold and microorganisms. Does the bulb require cleaning? Yes. The bulb may need to be cleaned every 3 to 6 months depending on its functioning environment. Dirt and oil on the surface of the bulb reduce output intensity. Upon installation, the bulb should be wiped down with the alcohol swab provided. Simply remove the bulb and clean with alcohol. Avoid touching the bulb with bare hands. The oils in your hands can reduce UV output. What is the meaning of microwatts per centimeter at 1 meter? Microwatts per centimeter at 1 meter is an intensity rating: the amount of UV-C energy exposed onto one square centimeter of surface area on a target placed 1 meter from the bulb. Why install the UV-C Air Sanitizer above the air conditioning coil? Moisture collects on the air conditioning coil, creating a damp surface for growth of mold and microorganisms. With the UV bulb over the A/C coil, the bulb will continuously infuse the coil with its rays, successfully disinfecting the air as well as keeping the coil clean. Yes! the UV-C Air Sanitizer and other UV products have been installed in all types of buildings including: homes, hospitals, offices, public buildings, food preparation plants, electric utilities companies, and more. Consumers constantly report improvements in air quality and reduced respiratory illnesses. Compared to high costs of medical treatment and missed work as a result of poor indoor air quality, the UV-C Air Sanitizer pays for itself quickly. the UV-C Air Sanitizer costs only pennies a day to operate, consuming about the same amount of energy as a 25-watt light bulb. Should the HVAC appliance fan or blower run continuously? No. This is not necessary. During normal operation of the heating or air conditioning, the blower will circulate the air over the UV bulb from 50-75 times a day, which is sufficient. During moderate weather, when neither the A/C or heat is on, it is recommended to open the windows to allow for fresh air infiltration and/or to operate the blower continuously (turn on the fan) to circulate air over the UV light. Does the UV-C Air Sanitizer produce a fresh-air smell? Many smells are not addressed by the UV-C Air Sanitizer, however, some unpleasant smells emanate from the development of microorganisms. the UV-C Air Sanitizer works to reduce mold and other common household germs, which in turn can create a fresher smelling environment. Does Joneca endorse products that produce ozone in living spaces? No! Joneca does not endorse the use of ozone in spaces that are occupied. Ozone has been linked to respiratory problems and is a known carcinogen. Because the UV-C Air Sanitizer does not produce ozone, the unit can remain turned on at all times. This feature allows the UV-C Air Sanitizer to continuously attack the microorganisms in the system. How much electricity does the UV-C light use? Roughly, the light will use 25 watts of power for one bulb. What precautions should be taken before opening or servicing the ductwork where a UV-C bulb is in use? Prior to any service of the HVAC system or ductwork, the UV-C Air Sanitizer should be unplugged and turned off. Read all warning labels and service procedures located in the installation manual. What effects will UV-C have on plastics such as coil pans? UV-C can cause a breakdown of the material over time, if the plastic is not UV resistant. Lab tests reveal no measurable breakdown of plastic material will occur if you position the bulb 30 inches or more away from plastic surfaces. 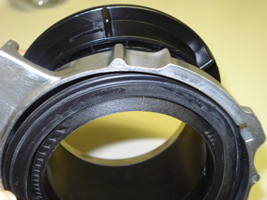 Why can’t I get my disposer to mount on the mounting ring? OR My Cushion Mount will not allow my mounting ring to drop? 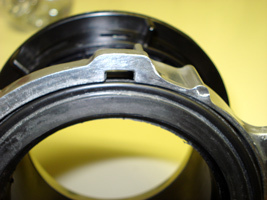 The cushion mount if installed correctly will allow your mounting ring to easily drop over it, allowing room for the projections on the disposer to fit into. 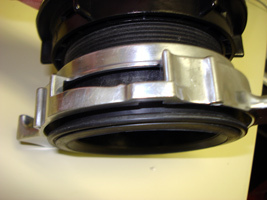 Looking at the Sink flange you will see a lip below the groove at the very end of the flange. Note: If the cushion mount is installed correctly the lip at the end of the flange will be fitted into the groove, in the cushion mount. I need to permanently wire the garbage disposer. Are there general instructions? FOR WASTE DISPOSERS EQUIPPED WITH A FOR WASTE DISPOSERS EQUIPPED WITH A GROUNDED PLUG-IN POWER CORD. A. PLUG INTO APPROPRIATE OUTLET This appliance must be grounded. In the event of a malfunction or breakdown, grounding provides a path of least resistance for electric current to reduce the risk of electric shock. This appliance is equipped with a cord having an equipment-grounding conductor and a grounding plug. The plug must be plugged into an appropriate outlet that is properly installed and grounded in accordance with all local codes and ordinances. If the supply cord is damaged, it must be replaced by the manufacturer, its service agent or similarly qualified person in order to avoid a hazard. 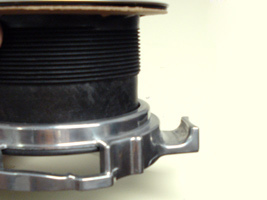 This disposer must be connected to a grounded, metal, permanent wiring system; or an equipment-grounding conductor must be run with the circuit conductors and connected to the equipment-grounding terminal or lead on the disposer. An acceptable motor control switch with a marked off position shall be provided at the time of installation to disconnect the disposer from all ungrounded supply conductors. The switch shall be mounted in sight of the disposer or in sight of the sink opening for the disposer. WARNING: Electric Shock Turn off power before installing or servicing disposer. All wiring must comply with local electrical codes. Do not connect electrical current at main breaker panel until adequate ground is established. Inadequate connection of the ground wire can result in a risk of electric shock. Consult with a certified electrician or tradesman if there is any doubt whether the disposer in inadequately grounded. Your disposer must be adequately grounded. 1. Turn off or disconnect all power to the wall junction box serving the disposer. 2. Open the junction box in the wall and remove the wire nuts or electrical tape or whatever is tying the old disposer wire to the electrical wire inside of the junction box. 3. Open the end bell plate at the bottom or the disposer. If you are using flexible armored (BX) cable: 1. Install cable fitting in the disposer end bell hole. 1. Install cable fitting in the disposer end bell hole. 2. Secure the cable to the fitting and install an insulating bushing or equivalent. 3. Connect white wire from the junction box to the white (or blue) wire of the disposer. 1. Install cable fitting in the end bell hole and secure the cable to the fitting. 2. Connect white wire from the junction box to the white (or blue) wire of the disposer. If your power supply cable does not include a grounding wire, one must be provided. Attach a copper wire securely to the disposer ground screw and attach other end of ground wire to a metal cold water pipe. Do not attach ground wire to a gas supply pipe. Use only UL Listed grounding clamp. If plastic pipe is used in your home, a qualified electrician should install a proper ground. What is the correct way to position the cushion mount? Position Your Support Ring BEFORE the Cushion Mount. 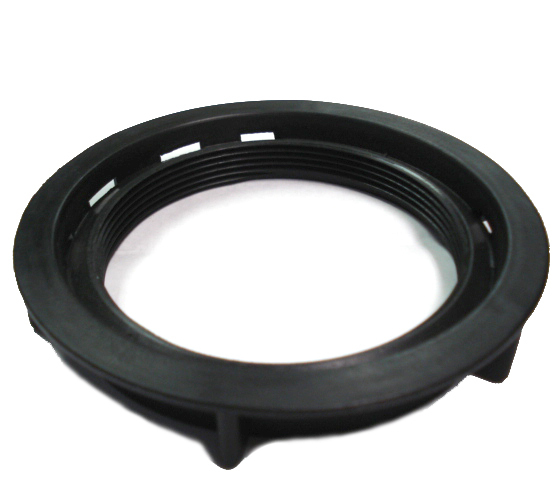 The rim (edge) of the flange fits perfectly within the groove of the Cushion Mount creating a flush appearance. Apply pressure with your thumbs around the rest of the cushion to attach completely . This shows the correct position. Another view of a correctly positioned Cushion Mount. Another view of a correctly Installed Cushion Mount. This Cushion Mount is installed incorrectly!! The disposer isn’t running at all! It could be a power problem. Check the power to the circuit that feeds the disposer. If the breaker is OK, then check the power at the switch. If you have power coming to, but not leaving the switch, then the switch is bad. Turn the circuit off and replace the switch. Why do people buy and use food Waste Disposers? By using a food waste disposer in the home, a homemaker immediately improves the sanitary conditions of the kitchen and waste storage areas. Eliminating food waste through a disposer system effectively removes a major cause of insect and rodent infestation, as well as bad odors. In today’s busy households, using a disposer saves time and provides great convenience in eliminating food waste, especially during meal preparation and cleanup. Food waste disposers are the environmentally friendly method of disposing of food waste. They reduce and recycle waste by shredding and pulping the organic food waste material into very small particles that are flushed down the drain. Will the motor wear out? All motors have the capacity to wear out eventually. How quickly depends on the stress or the load placed on the motor. The Bio Shield disposer models are designed to be long lasting. The durability and performance increases through the model range. The Heavy Duty and Deluxe models have slightly bigger motors which generate more torque and cutting power. This puts less stress on the motor, giving the Bio Shield disposer longer life. The use of permanent magnet motors in Bio Shield disposers is vital. The nature of the motor is that it increases torque as the load increases. This not only means top performance when a full load of food waste is being ground, but also prevents jams from occurring frequently. Do Bio Shield disposers have blades? NO. They contain no knives or blades… they use centrifugal force generated by the turntable to hurl the food waste against the grinding ring, shredding it into fine pieces. What kinds of waste can I place in my disposer? What Do’s and Don’ts are recommended? Use a medium flow of COLD water. If hot water is used, grease tends to coat the pipes instead of being flushed away. Grind hard materials (cooked bones, pits of fruit). This is necessary every so often to keep the lugs moving freely and to keep the grind chamber clean. 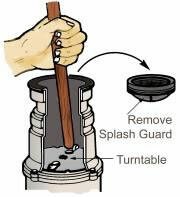 Do continue running cold water for 25 seconds after grinding is completed to flush the drain line. Remember the drain line from your sink may run for 30 feet or more before it exits your home. Flush for cleaning with cold water. An occasional lemon or lime slice will help to deodorize the grind chamber and elements. Don’t use HOT water when grinding. It is acceptable to drain hot water into the disposer between grinding periods. Don’t turn off disposer until grinding is complete. Wait until ALL food is ground before turning the disposer off. Don’t grind extremely fibrous materials (corn husks). These materials tend to form hard clusters of fiber which do not drain properly and interfere with the grinding elements. Don’t fill disposer with a lot of vegetable peels all at once. Instead, turn the water and disposer on first, and then feed the peels in gradually. Don’t grind clam or oyster shells, glass, metal, cloth, or harsh chemicals. These materials are too abrasive and will eventually wear down the grind chamber. Don’t dispose large amounts of fat or hot grease in food waste disposers. What type of disposer accessories are recommended? Where can I buy parts for my Garbage Disposer? Is my Bio Shield Disposer a batch feed or a continuous feed disposer? Unless your model specifies that it is Batch Feed or BF, it is a continuous feed disposer. Note: Both Continuous Feed and Batch Feed versions have the same grind process but different on/off switch mechanisms and modes of loading the food waste. Continuous Feed models require a wall switch (or Air Switch option). Food waste is fed through the splash guard and can be added to the grind chamber all the time the unit is running. Batch Feed Disposers include the On/Off switch in the throat of the Disposer and after food is placed in the grind chamber the switch is activated by the sink stopper. Only water is allowed to enter the Batch Feed unit whilst in operation. As soon as the sink stopper is removed the disposer automatically turns off. The food waste disposer is very noisy. All of our disposers feature the exclusive Torque Master Grinding System with its balanced turntable and armature that help keep noise and vibration to a minimum, however, it can become really noisy if something gets in there to cause a ruckus. With the disposer unplugged, grab a flashlight and take a look down the drain and see if you notice anything that can be causing the noise. Plastic or metal items are usually the culprits. I used Disposer Care® but never saw blue foam, did I do something wrong? When lessening the water stream, make sure the flow is not too strong. By rule of thumb, we say stream should be the width of a pencil. The water temperature must be HOT. Water should continue to run (at a pencil-width stream) while disposer is running and throughout the entire process. Do not sever the package before using. It is biodegradable and will decompose in the disposer. If the inner content is hardened together, knead the packet with your fingers to break it up. Why does my garbage disposer still smell after using Disposer Care®? Excessive build-up in the disposer may require additional uses of Disposer Care®. One recommendation we make is to run a stream of hot water into the disposer for a couple more minutes before using Disposer Care® to break up the excessive waste. However, never use hot water alone as it may melt the build-up that may re-solidify in your pipes as it is flushed from the disposer. You should never pour grease or other thick liquids down the drain because they can solidify and cause further blockage to you drains and pipes, in addition to causing a stench. Why did I not hear a “swish” of water when using Disposer Care®? If the sound is not heard, don’t panic, it doesn’t mean that Disposer Care® didn’t work. The issue may have been with your stream of water. If the flow going into the drain is too strong, the sound will be consumed by the water flow. Regardless, as the foam wells up, it is doing the job of cleaning the sidewalls and splashguard that cause the odors. I have a twin sink and the foam is seeping out of the non-disposer side, is that normal? Yes! Disposer Care® is designed to clean the entire disposer unit including the non-disposer-side sink. What is P-RO Reverse Osmosis System? P-RO RO Systems is a Drinking Water System that uses the principle of reverse osmosis to remove 95-99% of all the mineral and chemical contaminants from raw tap water. P-RO products gives you the quality of bottled water with the convenience of a faucet mounted on your kitchen sink. You’ll Love Your Water! How does Reverse Osmosis differ from a water filtration? Water filters use a screen to separate only particles of dirt sediment from water. Reverse osmosis employs a semipermeable membrane that removes not only particles but also an extremely high percentage of dissolved contaminants from tap water. The membrane (the P-RO vessel) consists of several thin layers or sheets of film that are bonded together and rolled in a spiral configuration around a plastic tub. The material of the membrane is semipermeable : it allows water molecules pass through while acting as a barrier to dissolved solids (i.e. : mineral chemical contaminants). When the feed water stream passes across the surface of the membrane, the P-RO molecules penetrate the membrane surface, working their way around the spiral and collecting in the center tube. The remaining contaminants are concentrated and washed from the surface of the membrane down the drain. What is Osmosis in general? Assume a membrane is semipermeable, allowing water to pass through while being closed to dissolved salts. Place a membrane between two compartments in a container. Then place a salt solution in one half of the container and pure water in the other half. Now a law of attraction happens. That is, two different concentrations of liquids within the same system will try to reach equilibrium (i.e. the same concentration of contaminants) on both sides of the membrane. Of course the only way for this to happen is for pure water to pass through the membrane to the salt water side in an attempt to reach equilibrium is called OSMOSIS. Reverse Osmosis is the reversal of the natural flow of osmosis. In a water purification system, the goal is not to dilute the salt solution, but to separate the pure water from the salt and other contaminants. When the natural osmotic flow is reversed, water from the salt solution is forced through the membrane in the opposite direction by application of pressure – hence the term Reverse Osmosis. Through this process, we are able to produce pure water by screening out salts and other contaminants. What is the actual process of the P-RO Home Reverse Osmosis System? The tap water first flows through a 20 micron particle FILTER to remove dirt, rust and other sediment. The water then flows into a carbon cartridge FILTER which takes out 98% of the chlorine and organic chemicals. The next stage of the process is FILTER 1 micron sediment filter or the Block carbon filter to filter multi-chemical compounds and suspension. The reverse osmosis membrane which will separate 95-99% of the dissolved contaminants from the water molecules. The contaminants are then washed down the drain. The next stage of the P-RO RO SYSTEMS process is the small CARBON FILTER removes the remaining traces of chemicals, tastes and odors. The Reverse Osmosis water is stored in a 3.2 gallons tank. Inside the tank is a balloon-like rubber diaphragm, pre-charged with 8-10 psi of air. As the tank fills, the air pressure increases and pushes the water out when the faucet is opened. The final element of the P-RO system is a chrome faucet. It is installed on the kitchen counter or the sink. It is a dual action faucet offering intermittent flow (to fill a glass, hold the handle down) or continuous flow (to fill a coffee pot, lift the handle up). How did Reverse Osmosis begin? 8, 000 large membranes to their mobile water purification units for troops in Desert Storm. In 1993, the U.S. Government bought another 6, 300 large membranes to purify flood water in the Midwest. Will Reverse Osmosis remove Sodium from the water? Yes. Reverse Osmosis was originally designed to make sea water drinkable for the navy. It is ideal for anyone on a low sodium diet. Does Reverse Osmosis remove Bacteria and Cryptosporidium? Yes. A Reverse Osmosis membrane has a pore size much smaller than bacteria virus, pyrogen or the cryptosporidium parasite. When functioning properly it will remove all microorganisms from tap water and produce sterile water. What does the P-RO series drinking water taste like? REALLY GOOD! Generally the taste of the P-RO water depends on the amount of contaminants in the tap water originally. If 95% of dissolved minerals and chemicals are removed, the Reverse Osmosis water may taste like distilled water (no minerals), bottled water (low mineral), or natural spring water (moderate mineral content). Where is the P-RO series drinking water system installed? The P-RO System is usually installed underneath the kitchen sink. Can the P-RO system be connected to an extra faucet? It only takes a 1/4″ tee and tubing to run the water to a refrigerator or an extra faucet. Some families run P-RO system to all of their bathrooms. 1. PRESSURE. The greater the water pressure, the better the quantity and quality of the water produced. Water pressure of 60 psi ideal. P-RO can include a booster pump to ensure adequate water pressure. 2. TEMPERATURE. 76*F is the ideal water temperature for Reverse Osmosis 40*F water will cause the production of R.O. water to fall to half of that at 76*F. The maximum water temperature recommended is 85*F.
4. MEMBRANE. Different membranes have different characteristics. Some produce more water than others; some have better contaminant rejection capabilities; some have greater resistance to chemical abrasion for longer life. P-RO system comes with 40 GDP (151.4 LPD) The thin film membranes combine the best of these characteristics and are considered the finest membrane in the world. How much water does the P-RO system produce? Under ideal conditions, the 40 GDP (151.4 LPD) thin film membrane is rated at 40 gallons of production per day (80gpd at 80~100psi). Under the average conditions, the consumer can expect 20 gallons of product water per day. But that’s still a lot of water for the average household’s drinking and cooking requirements. Can the amount of water produced be increased? Yes. There are a few ways: 1. At night, fill a pitcher with water from the tank. The emptier the tank the faster the water production. By morning the tank will be filled with fresh water. 2. A second storage tank can be added. An additional tank is required to double the capacity of the P-RO System. Does the P-RO come with a guarantee? Yes. The P-RO System (excluding filters) is guaranteed for one year for material and workmanship. All defective parts will be replaced free within the first year. The membrane has a one year pro-rated guarantee. What is the maintenance schedule for the P-RO System? The P-RO vessel, and P-RO polisher should be changed once a year. The P-RO System contains a quality carbon filter which will remove more than 98% of organic chemicals from the water. These include THMs(chloroform), DBCP, lindane, TCEs(trichloroethylene), PCEs(tetrachloroethylene), carbon tetrachloride chlorine, In addition to these organic chemicals, below is a partial list of other contaminants removed by the 40 GDP (151.4 LPD) thin film membrane. The percentage of removal shown below is a conservative estimate.